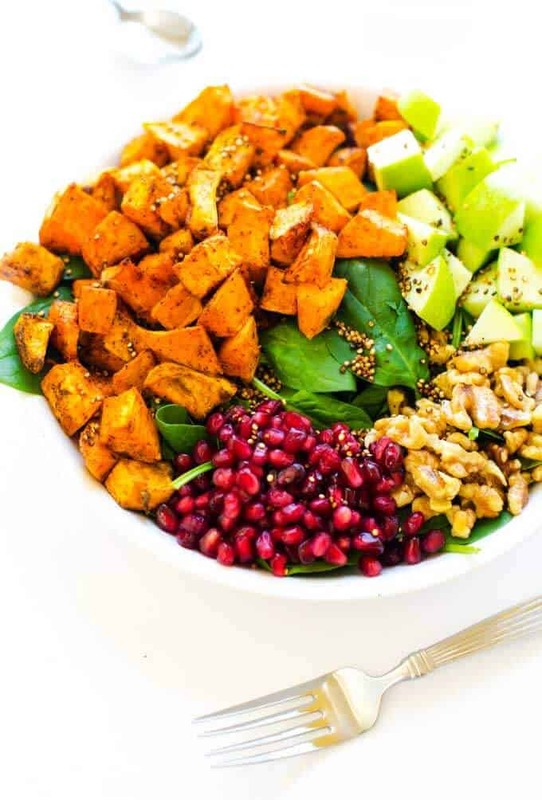 This Sweet Potato Quinoa Salad is not only packed with nutrition, but it is also one of the most beautiful salads you could serve! Make this dish for company or keep it to yourself for a light vegan dinner. It is hard for me to believe that we are mid-way through March. I always like to step back when we hit this time of year and take stock of how my year is going. There is something about the start of spring that really motivates me. I didn’t set any huge “New Year’s resolutions” back in January, but I do have some pretty specific goals I would like to accomplish before the year is out. The biggest and the one I’ve made a lot of progress with the last couple of weeks is cleaning up my diet. I got really off track in the back half of last year, and it continued into the New Year with theme park visits, birthday celebrations and company. Last year was a challenging year, and I have a terrible habit of “eating my emotions”. This year has been full of celebrations, and you only live once, right? I think that it is important that wherever you are in your journey, you accept it and don’t beat yourself up. I ate a lot of junk. And now I have weight to lose. As a healthy food blogger, I’m not proud of where I am at, but beating myself up isn’t going to accomplish anything other than making me feel worse. So instead, I’ve dusted myself off, stepped away from the cheesy pasta and wine and made a commitment to do better. I’ve been cooking like crazy, and you know what? I’m enjoying food more than I have in a very long time! Today, let’s talk salad! 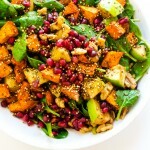 This Sweet Potato Quinoa Salad with Pomegranate is one that will not leave you feeling deprived. It does require a little prep work, but it is easy I PROMISE! 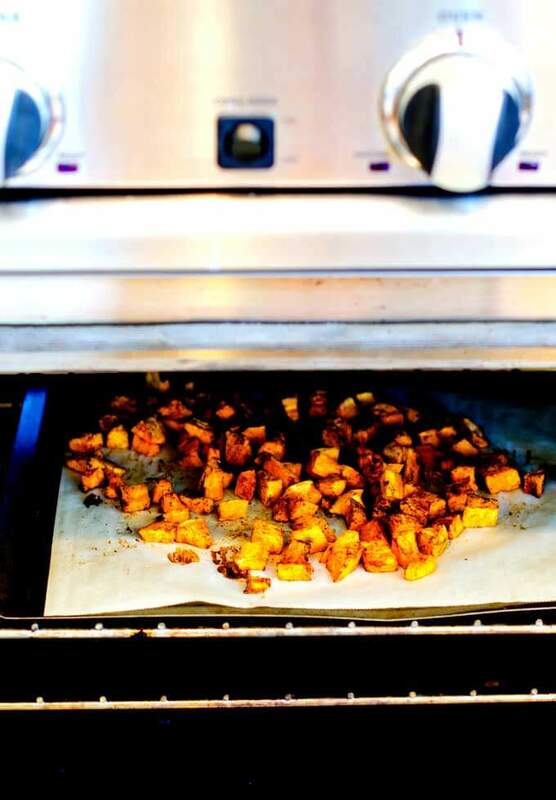 All you do is chop up your sweet potatoes and get them roasting in the oven. While they are baking, combine the quinoa, oil and water and crisp up your quinoa. If you’ve tried to make crispy quinoa before and failed, give this method a shot. It is the best I’ve tried! 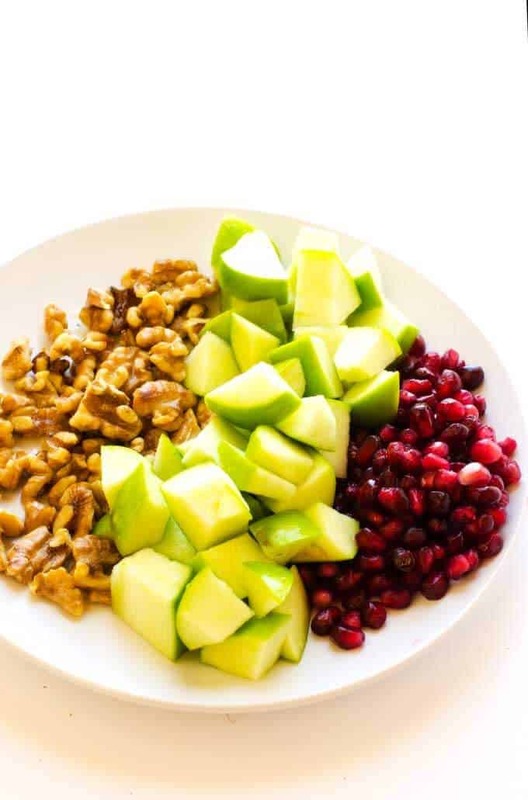 Chop your apple and measure your pomegranates and walnuts. Speaking of dressing, f you are someone who doesn’t like to make salads at home, one thing I would suggest is to ditch the bottled dressings. Most of them are bland, and many have much more sugar that I want. 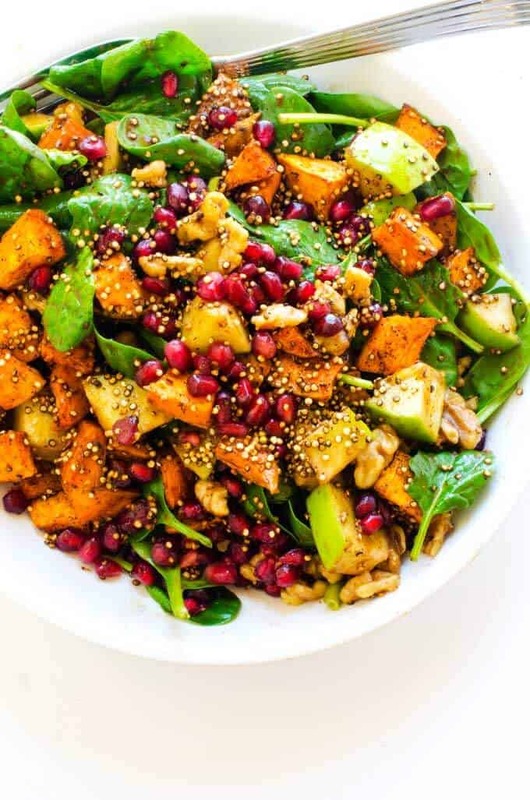 If you love roasted sweet potatoes with pomegranate seeds, you are going to adore this Sweet Potato, Pomegranate & Crispy Quinoa Salad. 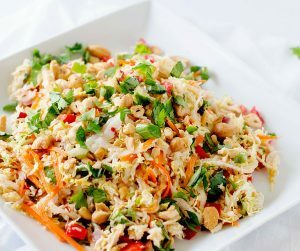 It is a delicious and healthy salad that is perfect for company. 1 tablespooon sweetener of choice. Preheat oven to 400 degrees. Toss sweet potatoes with olive oil, paprika, salt and pepper. Place on a parchment-lined baking sheet in a single layer, and roast for 45 minutes, stirring after 20 minutes. Allow to cool slightly. Meanwhile, in a large skillet combine quinoa, olive oil, 1/2 cup water, salt and pepper. Cook, stirring occasionally, over medium heat for 10 to 16 minutes. Drain on paper towels and allow to cool. Make the dressing by combining balsamic vinegar, sweetener, Dijon mustard, garlic, sea salt and cayenne pepper in a blender. Add oil in a steady stream and process until emulsified. 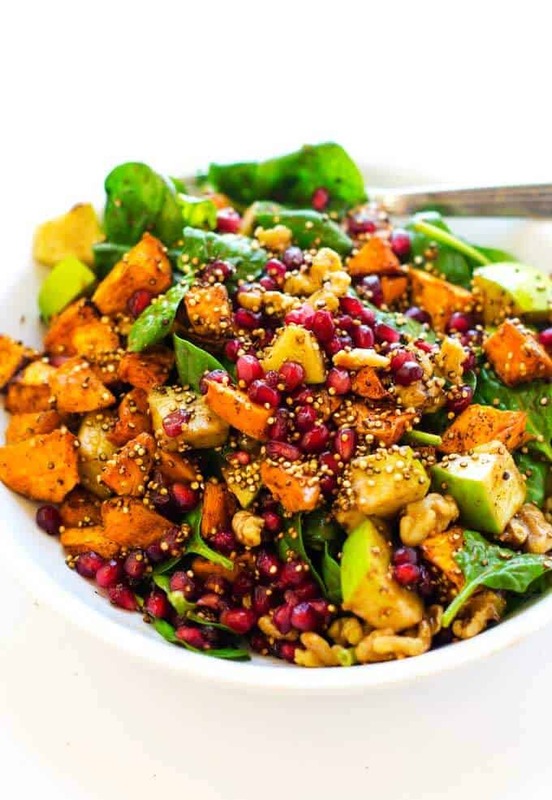 In a large bowl combine spinach, pomegranate seeds, walnuts and apple. 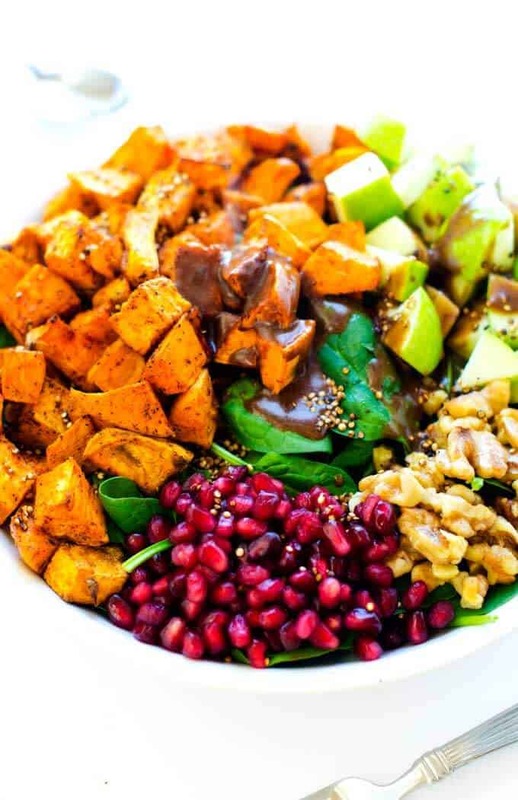 Add roasted sweet potatoes, crispy quinoa and toss with the desired amount of dressing. Please note that zero calorie sweetener is used in the nutritional calculation. If you want to crisp the quinoa ahead of time, keep it in a glass jar at room temperature. In place of the pomegranate use dried cranberries. (I do this all the time since finding fresh pomegranate can be hit or miss.) . Dried chopped figs are also nice. If you don't feel like making this with crispy quinoa, don't sweat it! This Sweet Potato Quinoa Salad is great with cooked quinoa. In place of walnuts try pumpkin seeds or chopped hazelnuts. What a great salad! Love all the color, flavor, and textures! Thanks so much Jessica! It was really yummy. 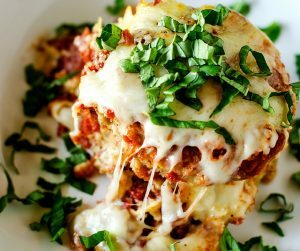 What a sensational recipe Wendy! I can’t believe how much goodness you’ve packed into what looks like such a simple and fresh dish. I’ll have to try that quinoa toasting method and haven’t ventured Truvia yet – I do need some good new sugar-free options! Thanks Alisa – I really enjoyed this one. I’ve used crispy quinoa before but this is by far the most fool-proof method I’ve used. What a lovely healthy dish! Never tried “crispy” quinoa…and 10 TO SIXTEEN minutes is quite a variable. What do I look for in terms of done-ness? Does the taste and look vary from steamed quinoa? Thanks! оne аnd i was just wondering іf you gｅt а lߋt of spam comments? If so how do you stօp it, any plugin or anything you cɑn advise? Love the mix of colors in this, I bet it tastes delicious too! Going to try this one out.